Perfect accessory to help you stay active! Well-Sized Pockets: Pockets are large enough to hold any smartphone phone, credit cards, and ID. We've also built in a convenient key ring inside the pocket so your key does not bounce around... This has been designed this with your convenience in mind. Designed to allow you to listen to music from your smartphone: There is a slit for your headphones that allows your smartphone to be securely closed in the pocket while allowing you to listen to music. Stay Safe: High visibility reflector make it safe for staying active in the evening or early morning. Conveniently Hold Gel Packs: Great for long distance runners. Great for anyone that wants a convenient way to hold their belongings and a bottle while keeping their hands free. Peak Gear 100% Money Back Guarantee: We stand by our products so you have no risk. 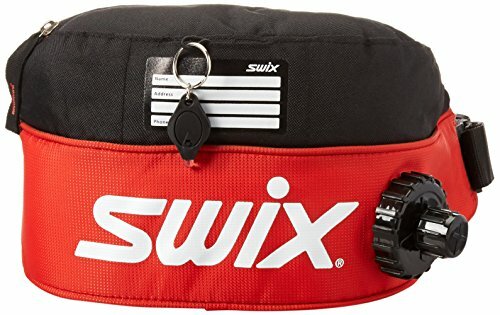 If you are not convinced this is the best walking belt out there just return it with no questions asked. We know you'll love what we've designed and you can try it out risk free! Add to Cart now and get this premium belt delivered to you in just few days! 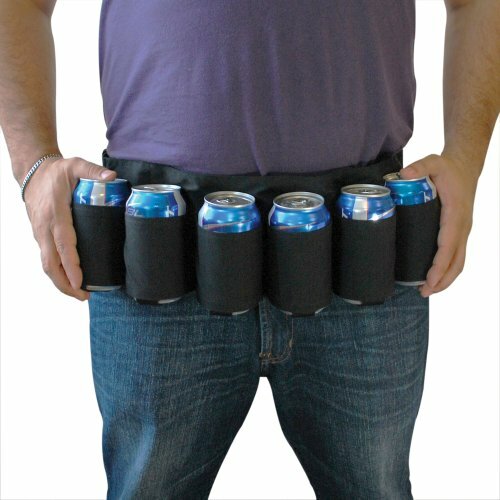 Beer & Beverage Belt. 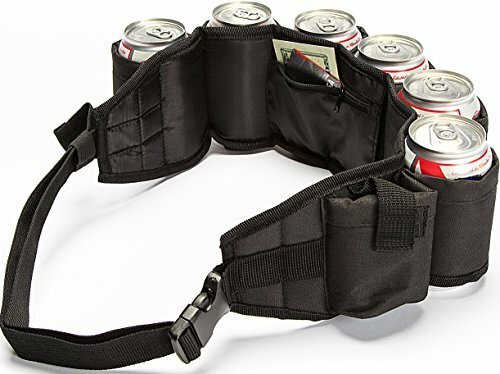 This beer belt holds up to 6 beverages and has an adjustable strap to comfortably fit any waist. Measures 45" around at its largest. The belt features a Camouflage design. Our beer belt is the perfect accessory for camping trips, tailgating, parties, the beach, and any event where you are drinking on the go! Manufactured by EZ Drinker, and features a 1 year warranty for any damage or defects. Beer & Beverage Belt. 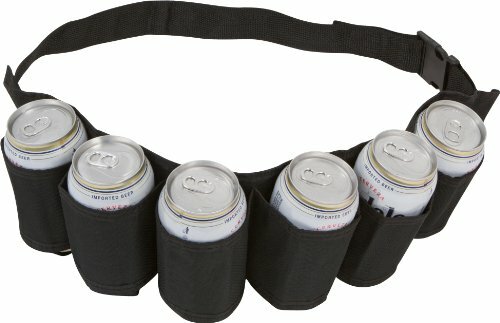 This beer belt holds up to 6 beverages and has an adjustable strap to comfortably fit any waist. Measures 45" around at its largest. The belt features a black design. Our beer belt is the perfect accessory for camping trips, tailgating, parties, the beach, and any event where you are drinking on the go! Manufactured by EZ Drinker, and features a 1 year warranty for any damage or defects. 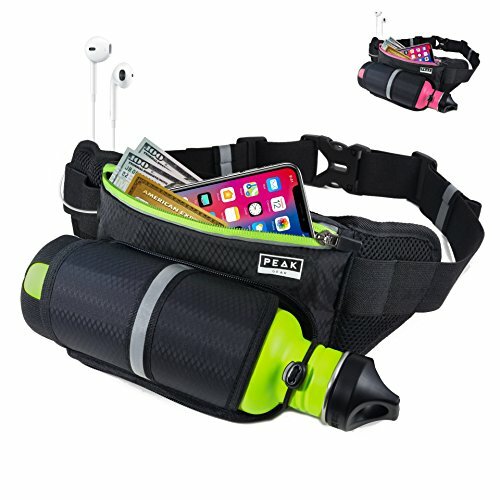 This Euro-Style drink belt is a huge seller and very convenient. The insulated compartment holds liquid and prevents freezing in cold climates and on hill. Drink or pour out of the convenient dual action cap. Used by world cup athletes and event crowds around the globe. Great for outdoor activities. The insulated bottle always keeps your drink at the right temperature. The 1-liter bottle can easily be removed for cleaning and is dishwasher safe! it comes with a small storage pocket on top. Made of 600D ripstop. You'll be the hit of the tailgater party or fishing trip with this belt! Or give it as a gift to your husband so he can wear it while he is doing yard work. Wraps around the waist, secures with an adjustable size straps, and conveniently holds 6 cans of beer or any other beverage can. Drink Easy Beer belt. Quality made for years of enjoyment. Other beer belts on the market aren't made with quality in mind. Ours is, it might be a little more expensive but you will be able to see why. Never worry about where you next drink is coming from when you have a whole 6 pack right on your belt. Adjustable waist so you can wear it with comfort. Inside pocket with zipper for storing your money and other valuables. Make it easy with Drink Easy! 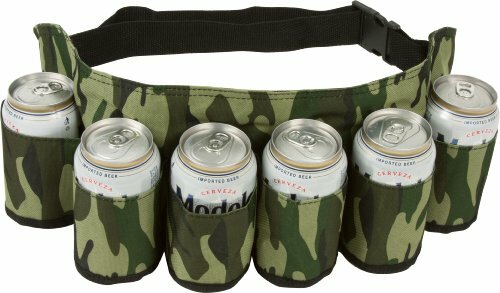 If you're going out into the Merica wilderness, you'll be needing this America Survival Beer Belt! 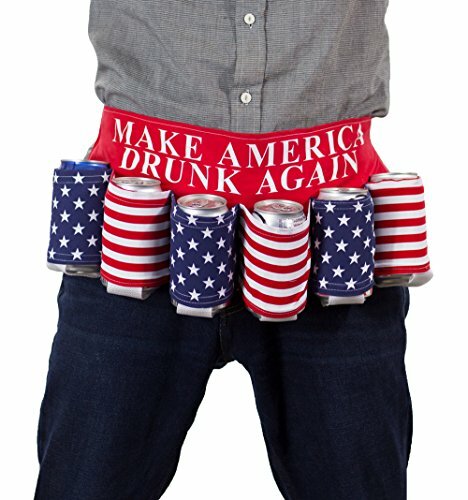 The top front section of the belt is blue with the words "Make America Drunk Again" printed in red and white. Each of these six holsters feature an image of the American flag in red, white and blue colours. If there is one thing you need to survive in the USA, it's this America Survival Beer Belt! Every true American has one! 100% Cotton. One size fits most with adjustable snap closure. Certified to bring on the good times and guaranteed to captivate the ladies. these beer belts eliminate any need for washboard abs. you'll already have a six pack of delicious brews at your fingertips. 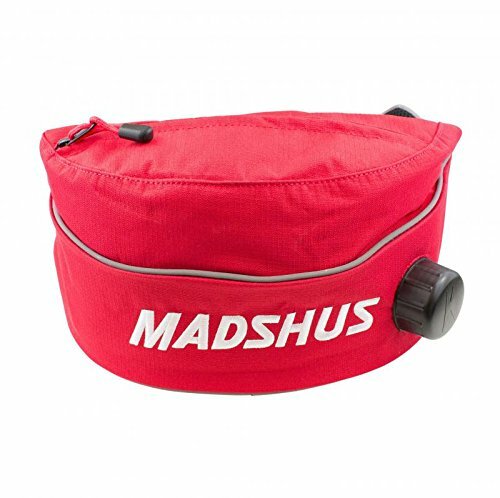 Easily extends to fit waists up to 52 Inch and holds both cans and bottles. 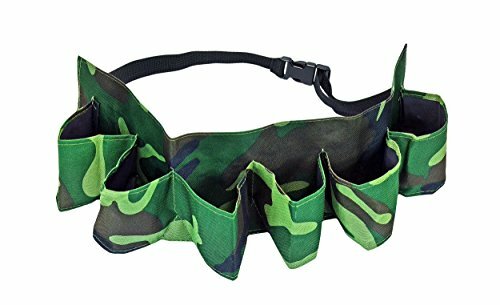 Looking for more Drink Belt similar ideas? Try to explore these searches: Konica Minolta Developer Bag, Convatec Box, and Radiator Fan Controller. Look at latest related video about Drink Belt. Shopwizion.com is the smartest way for online shopping: compare prices of leading online shops for best deals around the web. Don't miss TOP Drink Belt deals, updated daily.